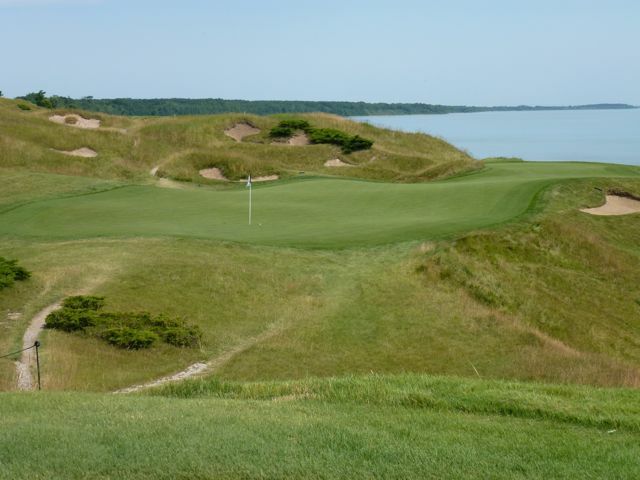 A long run of holes along Lake Michigan like the par-3 3rd at the Straits Course have helped make Whistling Straits an international destination. 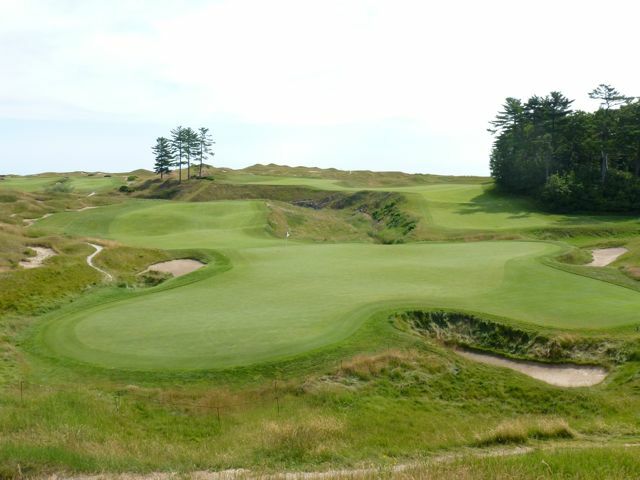 I don’t know what billionaire owner and developer Herb Kohler asked for when he hired Pete Dye to design and build the Straits Course at Whistling Straits, but if he wanted a true homage to an Irish links he didn’t get it. Though it looks the part in a sweeping glance there’s scant opportunity for the creative or interpretive play that real links encourage and windy sites demand. The routing is essentially an plus-1 twist on the routing Dye’s used at his more authentic links creation, the Ocean Course at Kiawah Island, and the prescriptive shot shapes required to play the holes are the same ones Dye’s been using for 40 years. 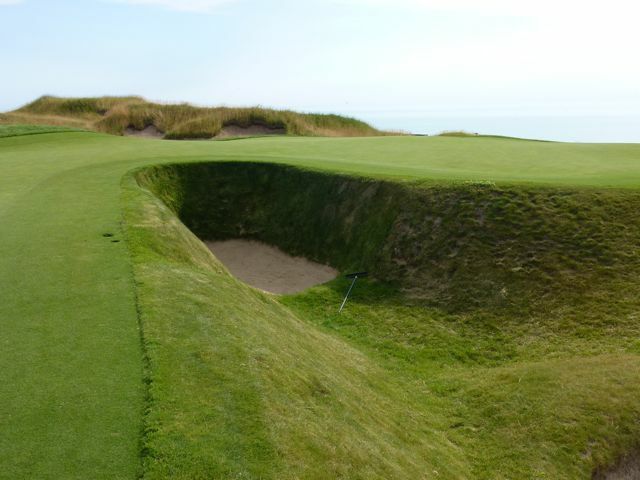 Of course Kohler didn’t really want an authentic links course — he had something bigger in mind. He hired Dye to transform what was once a former Army base and airstrip, with characteristics indistinguishable from the flat farmland that lines Wisconsin’s southeastern coast from Milwaukee to Manitowoc, into a potential site for major championship golf as well as a place that would blow the minds of players who had the cash to come play it the rest of the time. There’s not much links-like about the 18th, where only a huge drive and long aerial approach will suffice. That explains why the Straits Course turned out to be such a hybrid. Dye had many masters to please, from the guests willing to conform to a walking-only golf experience that matched the spectacular setting he gave them (especially considering the insulting prices), the magazines and raters who were watching very closely (and whose gushing approval would legitimize Kohler’s enormous investment), and of course the pros whom everyone knew would be competing here someday in one form or another (although “antagonize” might be a more accurate word than “please”). 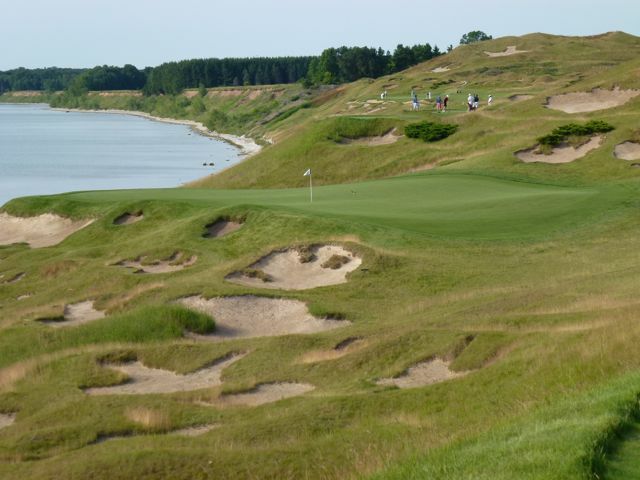 Dye and Kohler got that part right as the Straits has already hosted the 2004, 2010 and 2015 PGA Championships and will be the site of the 2020 Ryder Cup. That type of notoriety doesn’t hurt business. Dye’s 40-year shouting match with the professional game also helps explain why the Straits could only be a tournament course in links clothing: no one else in the modern era has designed as many courses with the advance knowledge that professional events would be held on them. The list includes Harbour Town, which opened on the eve of the inaugural Heritage Golf Classic in 1969, the Stadium Course at Sawgrass (The PLAYERS), PGA West (the Skins Game; Bob Hope Classic), Kiawah’s Ocean Course (1991 Ryder Cup, and the 2012 and 2021 PGA Championships), TPC of Louisiana (Zurich Classic), this course and the TPC San Antonio (Valero Texas Open), and that doesn’t include his own existing courses he prepped for major tournaments, like Crooked Stick, Bulle Rock or Kohler’s Blackwolf Run, 10 miles down the road. Let’s just say his pursuit of finding new ways to defend his courses against the .01-percent has made him a little obsessive, and the results can be one-sided. 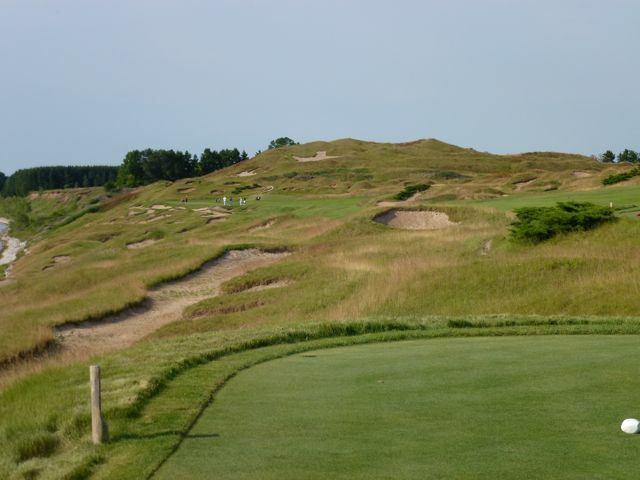 At Whistling Straits he probably, purposefully, whiffed on finding the right balance between recreational and professional play, gambling that visual theatrics would cover for the one-dimensional nature of the design. More veritable links creations like Old Macdonald and Pacific Dunes spread fairways to 50 and 60 yards wide or more, but most at the Straits are just 25 to 35 yards across and narrow further the farther you hit it making it easy for the winds bellowing off the lake to swat non-center strokes into the knee-high gaunch. Miss left at any point on the long par-4 4th and you’re chunking your ball…if you can find it…back up to the fairway. Unlike many seaside courses where wide aprons effectively make the putting surfaces play larger and more receptive than they are, the Straits’ medium-sized greens play true to size. Most have a dead side, usually a grassy litterbox set well below the putting surface that leaves no option but to lob the ball from the scruff back to the table top. The course’s creation story (along with that of the adjacent Irish Course) is well-known. If you want to find out exactly how much earth was moved or how much sand was dumped on it you can find the numbers in any number of articles, but needless to say Whistling Straits is one of golf’s epic feats of construction and imagination (as the locals say, Kohler gave Dye an unlimited budget, and he exceeded it). 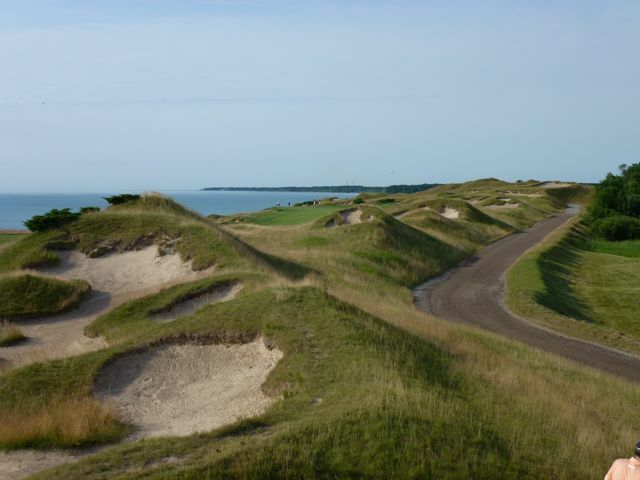 Crucially, Dye’s double-helix routing is tiered into the 70-foot high bluffs along Lake Michigan so that the strands of holes that don’t sit directly on the bluff are elevated like bleacher seats above those that do and views of the water are unobstructed from almost every point. 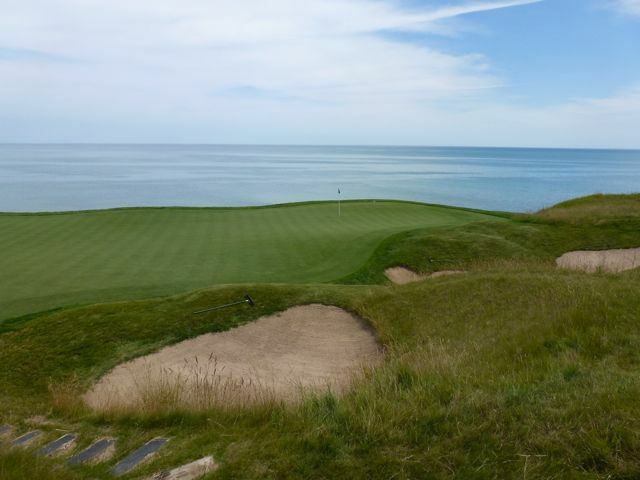 In all, fourteen holes run roughly parallel to the shoreline with eight directly on the cliffs, including all four par-3’s. But the real topic of conversation at the Straits is the incomprehensible earthworks; the rise and fall of fairways that move through grass-covered hillocks, mounds and embankments; and, of special import after the 2010 PGA Johnson Affair, the hundreds of “bunkers” Dye excavated that that consist mainly of scrapes, scabs and gouges of exposed sand rimmed with long grass, some no larger than manhole covers and many (or even most) of which are so far removed from play you wonder what’s the point. But as Tim Liddy said in a Feed the Ball podcast, the question became: once you start digging and chopping up the site, where do you stop? The view — from a very bad place to be on the par-5 2nd — gives an idea of the beauty and unforgiving nature of the Straits. Because everything here is manufactured, questioning the decisions behind the placement and presence of these features is fair game — at the very least it can all seem extremely overwrought, one too many gilds on a suffocated lily. Furthermore, if there was opportunity to create variety and newness, then why do several holes feel so similar to each other (the long par-4’s at 8 and 13; the par-5’s, particularly the approaches, at 2 and 16) — or to previous Dye holes (the par-5 11th/the Ocean Course’s 16th)? The long, angled green and sumptuous contours give the short 12th a huge range of flexibility. Yet it’s hard to be overly critical because the entire presentation is so commanding of wonder and respect, and makes such maximal use of the inspiring views. There are only so many places in the world where you get this many infinity greens sailing off the edge of the land into vastness, this many chances to hit you ball off the edge of earth. Particularly it’s true of the one-shot holes, which in spite of their apparent similarity — two heading each direction, each hanging over the water — play differently. On my first visit I hit 8-iron, 4-iron, sand wedge and hybrid. This “dead” bunker in the apse of the 6th green is perhaps the most authentic links feature on the course. With so much overkill you begin to admire a hole like the par-4 1st, which looks overcooked when you first see it but is remembered as almost subtle after everything that comes after it. Another favorite, at least for spectacle, is the mid-length par-4 6th where a green folds into two lobes around the most penal apse bunker on the course. This is the Straits in a nutshell, where half the hole appears to suggest a shot played along the ground, the other half only through the air, and death is located somewhere in between. The inspiring walk-off from beyond the 17th green.